British playwright Sir Tom Stoppard's epic play The Coast of Utopia and musical Spring Awakening have swept the Tony theatre awards in New York. The Coast's seven awards, including best play, broke a record held by Arthur Miller and Alan Bennett. 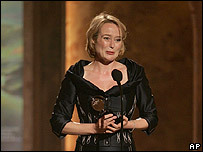 Actress Jennifer Ehle, who starred in the BBC's 1995 adaptation of Pride and Prejudice, won best performance for her role in the nine-hour trilogy. Spring Awakening collected eight prizes including best musical. One of its stars, John Gallagher Junior, won best actor. The musical, which began as a small off-Broadway production last summer, also picked up best choreography, score and orchestrations among its awards haul. Duncan Sheik, who composed the score for the production about angst-ridden teens in 19th-century Germany, said their success was because "people were ready to deal with something that had teeth". The Coast of Utopia, which also won best featured actor in a play for Billy Crudup and a number of technical awards, is Sir Tom's the fourth best play Tony award. The 69-year-old, who won his first honour in 1968, said: "I feel a bit nostalgic actually because this year it's 40 years since I first came here with a play. "I would be more than happy to have equalled the playwright of Death of a Salesman and a contemporary of mine, Alan Bennett," he added, having broken the record for the number of Tonys won by a play. The writer added: "It was a different planet in 1967, the Broadway theatre. It had a little ashtray clamped to the back of every seat and the author got 10% of the gross." The two productions took 15 of the 25 awards, while former Frasier star David Hyde Pierce won best actor in a musical for his role in Curtains. The Broadway version of Mary Poppins collected just one award for best scenic design in a musical.